This is my third small example of Strathmill in my collection but the first at cask strength, clocking in with a heady 54.6%. 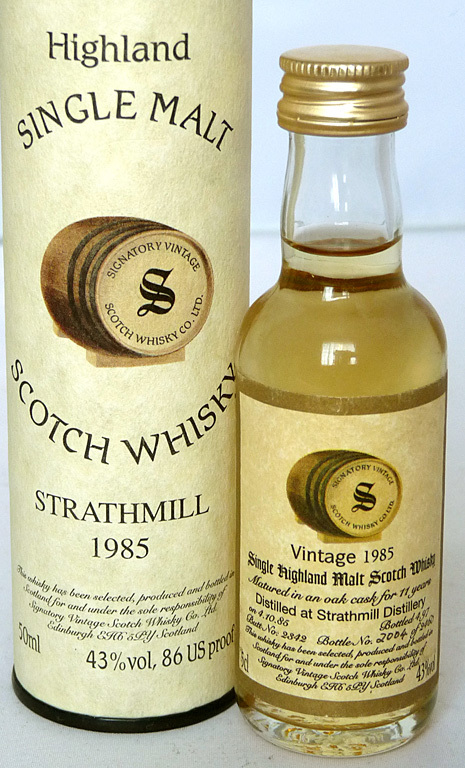 Since its beginnings in 1891 Strathmill distillery was focused on producing blending malt so examples of single malts are rare; Whiskybase only list 6 distillery releases but 56 by numerous independent bottlers. It doesn’t sound like the best ever example of Strathmill but for £6.50 for a miniature I’m not complaining. 30 years ago, in a Speyside distillery, a whisky was put to bed in a cask where it slept for 11 years. Some mornings the staff at Strathmill could almost hear it snoring. When it was awake it was quietly lapping the flavour out of the barrel. Eventually the independent bottlers Signatory bought the cask and bottled it up in 1996. 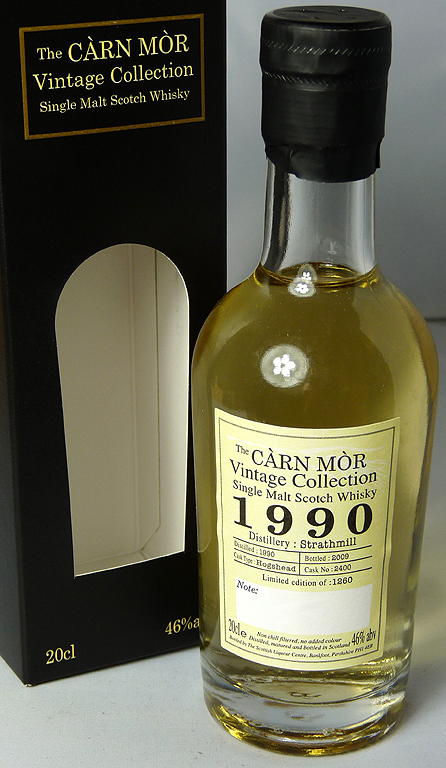 The Whiskybase link leads to the full 70cl bottle but I have a miniature, number 2004 of 2460. Single malts from Strathmill aren’t exactly common but in 1993 Oddbins bottled an expression from 1980 which kick-started independent bottlings from then on. The house style is fruity, spicy, sweet, medium-bodied and fragrant. The whisky is unpeated and usually stored in ex-bourbon casks.